Carol has been an instrumental part of our ATC team since 2008. She works behind the scene in our Albion office and spends her days crossing the T’s and dotting the I’s on everything billing related. Whether it’s processing invoices, tallying totals, or running audit checks, she’s become our “Financial Facilitator” – and is an expert at making sure our billing department runs smoothly. Her sweet temperament and easy-going demeanor (combined with her conventional love of chocolate) make her a favorite in the Albion office. In her free time, Carol loves traveling to visit her family, sight-seeing, and experiencing new things. 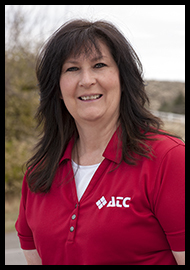 We’re proud to have this trusted and devoted number-cruncher on our ATC team!